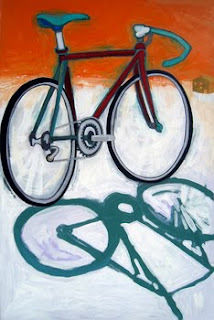 According to Pedalinghistory.com the first bicycle was invented by a Baron von Drais in 1817. It wasn't exactly a bicycle as we know it today, though it did have two wheels. It was actually a walking machine that helped him get around his royal gardens. To move the thing he walked, with the wheels turning, the front one steerable, mounted in a frame which he straddled. The device became a short lived fad, but it undoubtedly stimulated imaginations... and though not as useful as a mountain bike, it served its purpose on the smooth paths of his garden. The first Schwinn entered the scene, after many intermediate steps with hilariously large front wheels, in 1895. Eventually, throughout the 20th century hard rubber wheels yielded to inflatable rubber inner tubes, and complex gear ratios with the eventual evolution to our our complex, dynamically engineered equipment today. The essential function remains unchanged... getting here to there with greater ease. Whatever your ultimate destination, make sure you enjoy the sights along the way. Schwinn is the ideal brand of the first bike. My first and best mountain bike is also Schwinn and I still use for now.